Chinese Red Headed Centipedes are native to East Asia and parts of Australia; they live in moist environments and can grow up to 8 inches long. Their venom is reported to be far superior to morphine for pain control. They have been used in Chinese medicine for centuries. You can find Red Headed Centipede for sale at Chinese night markets; they are usually skewered onto sticks and deep-fried. They have a slightly bland bitter taste. They taste better grilled with a little salt or soy sauce. 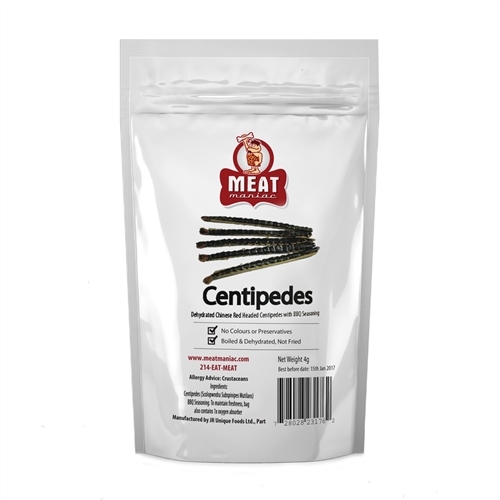 Ingredients: 100% dehydrated red headed centipede (Scolopendra Subspinipes Mutilans) from farm source. Each pack contains 5 x centipedes measuring 0.5cm x 9cm. 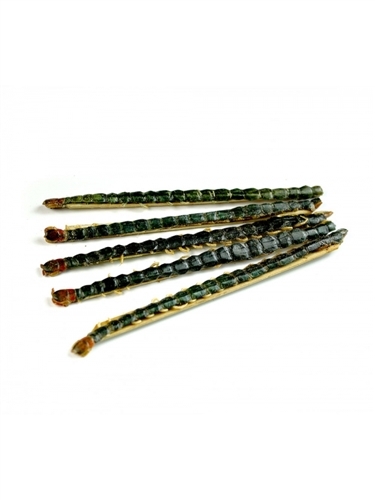 Each centipede is attached to a non-edible bamboo stick to protect it from breaking.